Holy hand grenades! Edo is flooded, and by flooded, we mean crazy-flooded. Bridges are crumbling, rivers are washing past retaining walls, and everything in Edo is floating away, including our vengeful ronin, his foe, and his little boy. In an ironic show of samurai respect, little Cub Daigoro gets saved by the conniving Retsudo Yagyu. 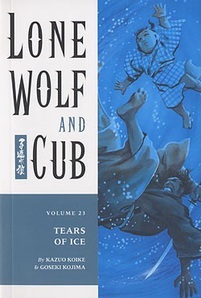 And proving he can lend a hand, too, Lone Wolf Ogami pulls someone to safety as well - but maybe he should have let him drown. Eventually, the two opposing master swordsmen dry off and go head to head in a sword fight of a thousand stances and couple of days length. This seems like it could be the deciding bout between the two, unless that nasty, Abeno Kaii gets in the way, and he seems to do that a lot lately.